Blazing Wisdom is pleased to announce that Khensur Rinpoche Sonam Topgyal, senior Khenpo of Riwoche Monastery and founder of the Riwoche Society and Temple in Toronto, Canada, will return to BWI from September 16-23, 2011, to continue his precious instruction on the Guhyagarbha Tantra, based on Ju Mipham Rinpoche’s famous commentary. Chadral Rinpoche, Dudjom Rinpoche, and others, and a master of the experiential lineage of the Long Chen Nying Tig teachings as well. Tulku Sherdor will be offering his service as interpreter and will lead supplemental teaching, practice and review sessions as well. 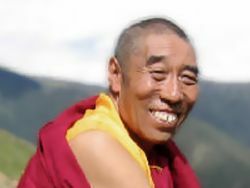 This program is particularly suited and recommended for those who consider themselves serious students and practitioners in the Nyingma lineage, and of the higher tantras in general, as the Guhyagarbha and its commentary are a crucial foundation for all deity meditation practice in the Nyingma Mahayoga vehicle, and for understanding the basis and view of tantra. It illuminates the meaning and purpose of empowerment, samaya, mantras, mandalas and other Vajrayana topics.